Judy Chicago…one of my heroines is 75. How happy am I that she, her thoughts, and her art are being celebrated. Color me…a fan who dreamed long and hard about bringing “The Dinner Party” to St. Louis. You Go Nyehaus and Mana Comtemporary. 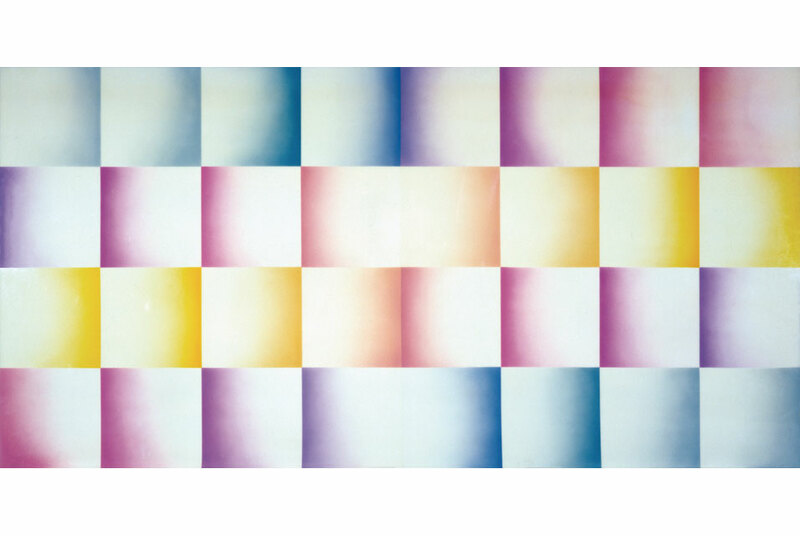 Judy Chicago, Flesh Fan (from the Fresno Fan series), 1971, acrylic lacquer on acrylic sheeting, 60″ x 120″. JERSEY CITY, NJ.- Nyehaus presents “The Very Best of Judy Chicago” at Mana Contemporary in Jersey City, NJ. One of the nationwide exhibitions and events celebrating the artist’s 75th birthday, this major survey of key works from Chicago’s career includes her early output as well as many significant and monumental artworks that will be new to East Coast audiences. According to Nyehaus founder Tim Nye “Language is an evolutionary process and Chicago has compressed the history of art, her history of art, into 50 years of an evolving language.” Mana Contemporary co-founder Eugene Lemay said “Mana is thrilled to have the opportunity to showcase this extraordinary American legend.” The exhibition includes test plates and drawings from her most well-known opus, The Dinner Party (permanently housed at the Elizabeth A. Sackler Center for Feminist Art at the Brooklyn Museum), as well as the 32 foot long Prismacolor drawing In the Beginning which reinterprets Genesis and places women at the center of birth and creation. The inspiring Rainbow Shabbat, a large-stained glass window presenting a hopeful vision of the future which was the culminating work in the Holocaust Project: From Darkness into Light will also be on view. New to most viewers will be Atmospheres, a series of fireworks pieces that Chicago created in southern California between 1968-1974. In 2012, as part of the “Getty Performance Festival”, she picked up where she left off in order to present two major pyrotechnical works along with a new dry ice piece titled Sublime Environment. These innovative performances are collected in a limited edition suite titled “Judy Chicago” On Fire”, published by Nyehaus. The Mana Contemporary show complements the Brooklyn Museum’s “Chicago in L.A: Judy Chicago, 1962-1974,” opening on April 4, 2014. Mana Contemporary will also host a special event on April 12 with Judy Chicago in dialogue with Jeff Deitch, the former director of the Los Angeles Museum of Contemporary Art. A reception and party to celebrate Ms. Chicago’s 75th birthday featuring a cake designed by the artist will follow the conversation. Born in 1939 as Judith Cohen in Chicago, Illinois, the artist changed her surname to her hometown following the deaths of her father and first husband. She is regarded as one of the leading figures in promoting and articulating a feminist approach to art-making. Chicago is the recipient of numerous grants, awards, and honorary degrees from prestigious colleges and universities, and her work is in the collections of numerous museums, including the British Museum; Brooklyn Museum; Getty Trust; Los Angeles County Museum of Art; Museum of Fine Arts, Santa Fe; National Museum of Women in the Arts; Pennsylvania Academy of the Fine Arts; and San Francisco Museum of Modern Art. Judy Chicago lives in Belen, New Mexico, with her husband photographer Donald Woodman and their beloved cats.